Geoff comes from a family of teachers, grew up in rural Connecticut and spent long summers in Maine. One of the formative experiences in his life occurred just after his 13th birthday. At age 12 children could go to the Saturday night movies in Vinalhaven for $0.10; the price for those 13 or older was $0.25. The Saturday after his birthday he passed himself off as still being eligible for $0.10. When his father, a man with a strict moral code, found out, he made Geoff walk the three miles to town and repay the theater owner the extra money owed. It was a lesson learned. You cannot have a movie theater – or a school, or a government that works - without honesty. You cannot have trust without honesty. Geoff is a retired physician/rheumatologist who practiced in Bangor for 40 years and organized arthritis clinics throughout eastern Maine. Before running for the State Senate in 2012, he served on the Bangor City Council for 9 years. Geoff and his wife Lucy have two children and six grandchildren. They live on a small farm on the outskirts of Bangor where they have a number of chickens as well as three goats. Throughout his years of medical practice, people trusted Geoff with the intimate details of their lives. He saw firsthand how a devastating arthritic disease could completely change a life. The inequity of our health care system was deeply troubling to him; those with insurance generally did well while those without it often faced disability, financial ruin, and possibly early death. He helped many individual patients but felt he could do still more by working at the legislative level to improve health policy. Geoff’s experience on the Bangor City Council showed him that people of good will, working together, could accomplish great things. They could spend the people’s money carefully, provide for those in need, and increase trust in the function of government. Over the past six years he has found many people in state government with whom he can work well. They also view improving health care as their number one priority. In the spring of 2018 Geoff was instrumental in starting the Legislative Health Care Task Force, a bipartisan group of legislators, insurers, and health care professionals. 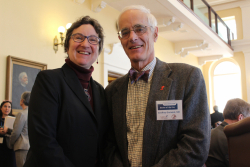 Its mandate is to provide better care for all Mainers, simplify a patient’s financial obligations, increase access, and save health care dollars. It is a tall order but absolutely vital if we are to maintain the health of Mainers and save business money. Geoff wants to return to Augusta to continue his work. Geoff and his medical partner ran a successful business and provided the best care they could for their patients without regard for their patients’ ability to pay. Most of the major obstacles they faced were caused by insurance companies; in their two doctor office they had one staff person whose sole job was to rebill and resubmit insurance claims. This was an enormous waste of time and effort. Over time Geoff came to believe that the greatest challenge facing Maine was how to provide universal, affordable health care. It is at the root of all personal and economic health. He has worked on various aspects of this issue for his six years in the Legislature – working on transparency (so that patients can find out ahead of time what a procedure will cost and shop for the best price), on expanding MaineCare so that everyone has the possibility of leading a healthy life, on decreasing the cost of medicines, and on simplifying the bewildering choices that face patients as they apply for and use their health insurance. He finds the issues both fascinating and frustrating. There are no easy answers but he believes that listening, negotiating and persisting will eventually bear fruit. Educational institutions from pre-K through graduate school are a major resource for growing Maine’s economy. The schools in the Bangor region are some of the best in the state and are a major economic draw; we need to keep them that way. Mainers with training and education are more likely to contribute to our well-being and less likely they are to turn to general assistance or get involved in the judiciary system. Studies show that they are generally also happier. Bottom Line: $1.00 invested in education returns $9.00 to the taxpayers over time. In 2017, over one Mainer died each day of an overdose, one of the highest rates in the U.S. For every life lost there are 4 to 5 others who are devastated by the death of a mother, father, son, daughter, family member or friend. This is totally unacceptable; we cannot afford to lose anyone. The causes of our crisis are many. They include poverty, poor education, lack of jobs, punitive drug policies, exploitative media, and confused societal values. The financial cost of our crisis is also enormous. It reaches into all corners of our state and affects all aspects of our budget including corrections, police, medical, child welfare, work force development, and education. I served on the Legislative Opioid Task Force and together we developed a public health plan that addresses programs for prevention, treatment and recovery. This concerted effort will not only save lives and create hope for affected families but will also be the most cost-effective approach. But it is going to take time, resources and resolve. Over the past two years we have secured funds for a detox center as well as a Women and Children program in Bangor. During the next budget discussions, I will be supporting peer recovery programs such as the Bangor Area Recovery Network (BARN), Recovery Coaching, prevention programs that reduce stigma, housing for those in early recovery and job training programs for people in recovery. Great credit also goes to the Health Leadership Board has taken the lead in our area to affect change and access to care. There is too much outside or ‘dark’ money in Maine elections. We need to enhance the role of everyday people in our democratic process, not hand over our government to moneyed interests. The United States Supreme Court’s ‘Citizens United’ decision of 2010 redefined corporations as ‘people’ and opened the flood gates to contributions of money from secret donors in elections. The integrity of our democracy depends on everyone having an equal voice. Publicly financed elections have put Maine on the path to taking at least some money out of the political process - although there is still a long way to go. Since 1996 Maine’s Clean Election laws have been used by up to 80% of Republican, Democrat and Green legislative candidates. I ran as a Clean Election candidate in 2012, 2014, and 2016 and am doing so again in 2018. The Bangor region provides more than $1.2 billion in tax revenue to Augusta and by statute should receive $5 million back in revenue sharing. Governor LePage’s tax breaks in 2012 primarily benefited Maine’s wealthiest citizens, and cut back support of our region by $3 million. This shortfall has been made up by our local taxpayers. Maine needs comprehensive tax reform that will gradually shift the balance of our tax burden away from local property owners and small businesses to wealthy individuals, large corporations and out of state interests. When Governor LePage’s tax policies have unfairly favored the wealthy as opposed to the middle class and working families I have consistently voted against them. Maine needs good jobs for everyone. This requires a skilled work force trained for tomorrow’s jobs, centers of excellence to nurture innovation, and streamlined permitting for new businesses. The Bangor region is poised to lead in the ‘Brain Gain’ competition because of our quality of life, excellent schools and educational institutions, and our creative economy. I am bullish on the Bangor region and view it as one of the most desirable places to live in the US, combing the amenities of a cultural center with a semi-rural location. Affordable health care for everyone living in Maine is essential to a sound economy. Maine spends 20-22% of our state product on health care; this compares to the US average of 18% and 10%-13% in other first world countries. Neither party can no longer turn a blind eye to the changes we need to make, no matter how powerful the forces working to preserve the status quo. It is not fair to our kids to leave them with such a broken system. Working together on health care for all Mainers is also the right thing to do. Our individual life depends on good health. I have been centrally involved with the bipartisan Health Care Task Force in this session. We are studying ways to simplify our insurance system, save money on pharmaceuticals and focus our hospitals on outcomes, not fee-for-service medical care. 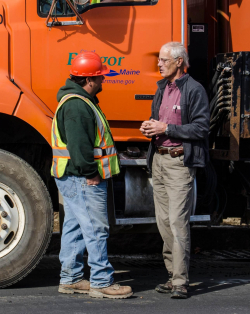 We need to improve access for all Mainers, cut costs, and improve transparency. I am confident that we will make meaningful progress in 2019. We live in a wealthy country - despite the gloom that we often hear from politicians. There are resources here for everyone but we need to have the courage to revamp the way we tax ourselves. Taxes are what we pay for our civilization, for our roads and bridges, for our defense, education, for things we hold in common. Our tax structure is designed for a time when wealth was measured in land – hence our reliance on the property tax. Wealth today comes in many forms and we need to just our tax system accordingly. The most efficient and effective taxes are ‘broad based and low rate’. Exemptions are minimal. New Zealand is perhaps the best example of a rational tax structure. Change does not come easily but we can move incrementally, slowly expanding our tax base to encompass more of our economy and thus decrease our rates. In particular we need to hold the line on property taxes. We all, individuals and businesses alike, enjoy the benefits of living in safety and we all should share the cost.